Located 4 miles from the Garden State Parkway Crystal Inn is located in Eatontown New Jersey 16 minutesâ?? drive from the Long Branch pier and beach. A seasonal outdoor pool and free WiFi are available. The rooms at the Crystal Inn Eatontown have a flat-screen cable TV microwave and refrigerator. There is also an en suite bathroom with a hairdryer. A continental breakfast with coffee is served daily. 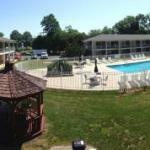 Guests staying at the Eatontown Crystal Inn can also enjoy the gazebos and outdoor picnic area by the outdoor pool. The Monmouth Park Racetrack is 4.3 km from the motel while Monmouth University is 6 km away. Shopping and dining options in Downtown Red Bank are a short drive away.